Blue Bottle has arrived to Tokyo. The first shop, in Kiyosumi, is on the other side of the city for me. So, even though I live in Tokyo it is about an hour from where I live. 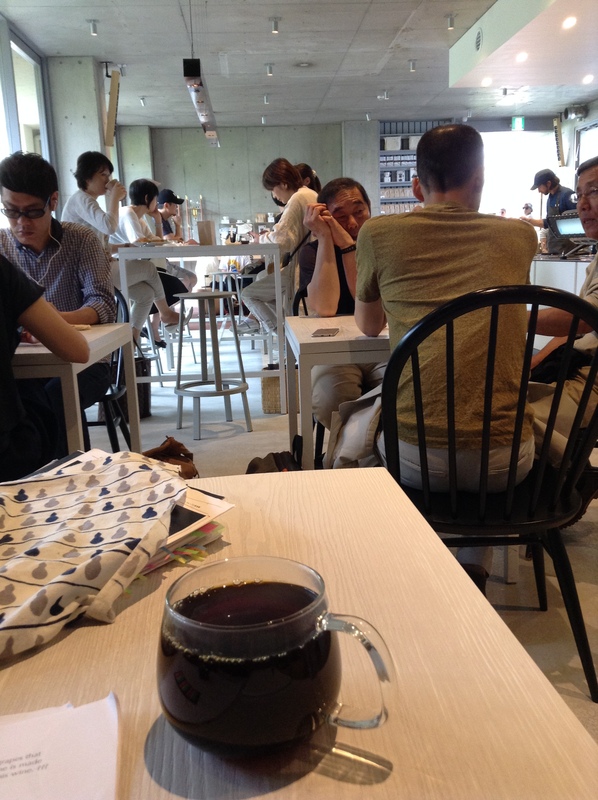 Blue Bottle’s second shop has opened in Aoyama. It’s a busy shop and not the best place to do writing or editing. Quite noisy in fact. I couldn’t hear the staff call out my name to get my coffee. Eventually seats opened up on the deck, where it was quiet and I could get some work done. There is a buzz in the restaurant. It seems that many of the customers, like myself, are first timers. Taking it all in, looking around, checking things out, lots of questions for the staff. The staff helped me to select a Papau New Guinea single origin. She said it was “like peach”. The coffee, served in a glass mug, was fruity. Blue Bottle is getting a lot of press in the media, which explains the big crowds. Not sure, but I guess this will die down at some point. The Aoyama location is just off the main street where there are many brands like Issey Miyake and Prada. The shop is up the stairs on the second floor of a building that looks like it was an old apartment building. Don’t know why, but the shop doesn’t open up until 10 a.m. Frustrating for those of us who prefer to have coffee earlier in the day, but many coffee shops in Tokyo don’t open until 10 or even 11 a.m.
3rd Burger recently opened in the Ark Hills South Tower. I thought it was a new restaurant to Tokyo until I came across a second shop in the Aoyama/Omotesando area. The clientele in Aoyama is young and hip. Diners are given a buzzer after placing their order. Not exactly fast food, but the food does comes about five minutes during the busy lunch hour. 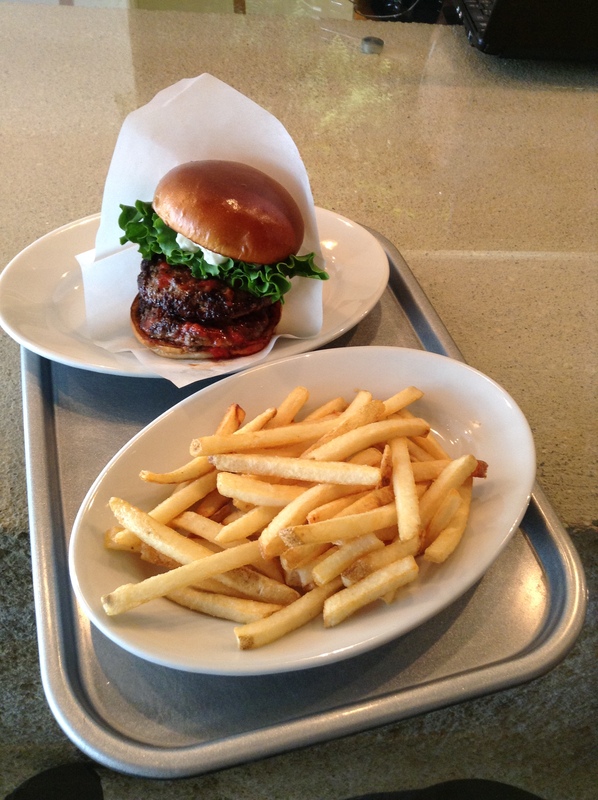 The meaty burger is juicy and the fries are excellent. Burger options include avocado wasabi and basil and tomato. Burgers are served with fresh lettuce and tomatoes. The only downside was that ketchup is given in small packets. Burgers start at about 400 JPY and fries at 300 JPY. 3rd Burger has a variety of smoothies in flavors like carrot, banana, and fresh tomatoes. The Aoyama shop is brightly lit and there is a communal table at the front of the shop. Now, if they would only open a shop on the Chuo Line. ** Updated Dec 2016 – sadly Beacon has closed. A new shop, Crista, has opened in the same space, also by the same owner and chef. Brunch at Beacon is a taste of America in Tokyo. David Chiddo works his magic at this urban chophouse located between Shibuya and Omotesando. I picked Beacon for Sunday brunch thinking I would go for a burger and martini. 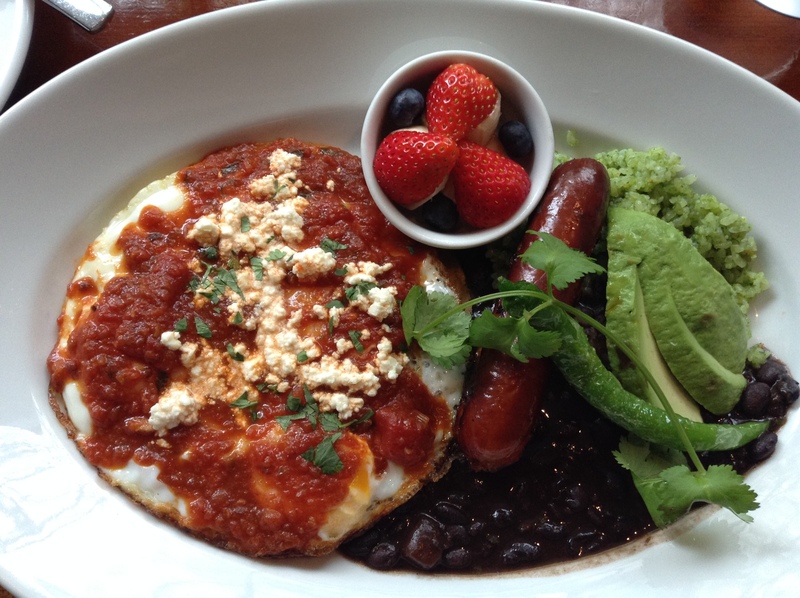 But, once I took a look at the menu the huevos rancheros jumped out of the menu and I am so glad I got it. I loved the green rice and beans. I was sad when the plate was empty. And, I could see that many others in the restaurant were enjoying the burger. Portions are generous, another nod to American brunches. 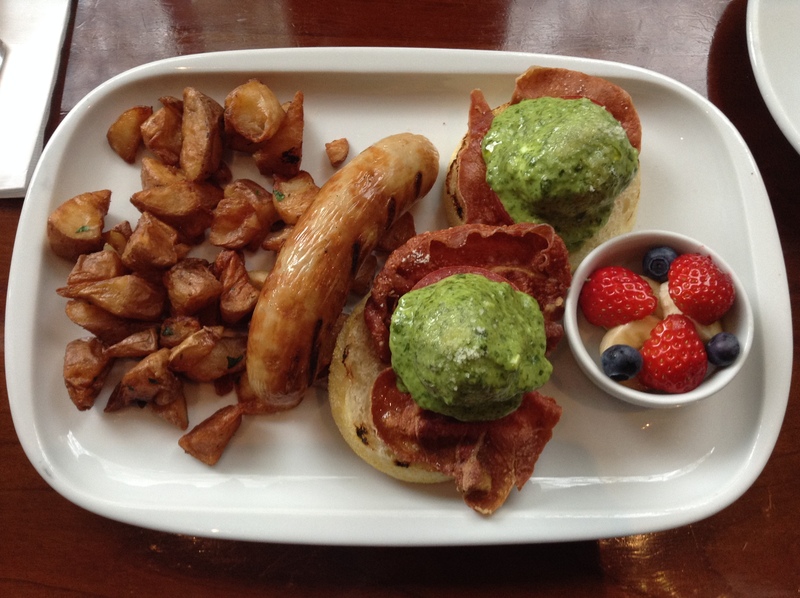 The brunch menu includes a selection from the bread basket, fruit, and coffee, tea, or espresso drinks. My girlfriend who studied at university in Minnesota also felt right at home with this hearty plate of eggs Florentine. Many of our fellow diners were talking in English, something that I am not used to, so I totally felt like I was back in the USA. Staff are attentive and there is a great buzz in the restaurant. Diners are here to relax and be taken care of. There is a counter if you are dining solo. Beacon’s a great spot for meeting friends at. It’s popular so reservations are highly recommended. If you are from America, you will feel right back at home. Other brunch menu highlights include Belgian waffles and fried chicken, steak and eggs, and almond French toast made with brioche. One of Tokyo’s best brunches.